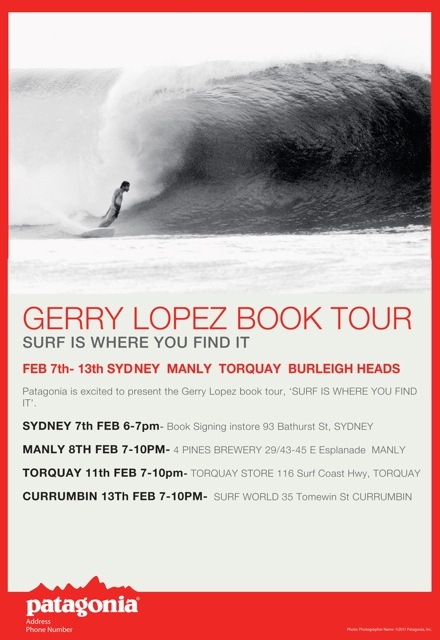 "Gerry is coming out (to Australia) next week and I"m doing the tour with him promoting the film, A Deeper Shade of Blue. AND I have the board he brought to Australia for the Bells and Coke Contest that he took to Bali when I took him in 1974 and has an amazing story of which we will tell on the night with the board that you would have seen at my house." Obviously Jack McCoy is an expert on Gerry's exploits in Australia. So Gerry never shaped a board at Bennett's, but they did make legitimate licenced copies. Tim Ellis has never spoken a word of a lie to me so lets assume it was me who heard the story wrong about Gerry surfing Long Reef. I have been lucky enough to meet Jack and the board Gerry took to Bells / Bali at the Deus Surf Swap 3, when Jack brought it along to share the stoke.